The European Honey-buzzard is one of seven flagship birds in Birdlife’s Flight for Survival campaign to raise awareness of the scope and scale of the illegal killing of migratory birds. The European Honey-buzzard is a bird of contradictions. Despite its sugary name, it doesn’t eat honey. Its main food isn’t even bees: it relies more on the larvae of wasps and hornets. Shifting up and down its perch and bobbing its head from side to side, it uses its needle-sharp vision to spot the stinging insects and follow them back to their nest. Here, it unsheathes its long talons, disembowelling the nest and often carrying it whole to the forest floor to plunder it further. But its diet isn’t the only contradiction. The European Honey-buzzard isn’t a true buzzard, either: it is actually more closely related to kites. The similarity of its plumage to the Eurasian Buzzard, especially in juveniles, is instead thought to be an intriguing case of mimicry. 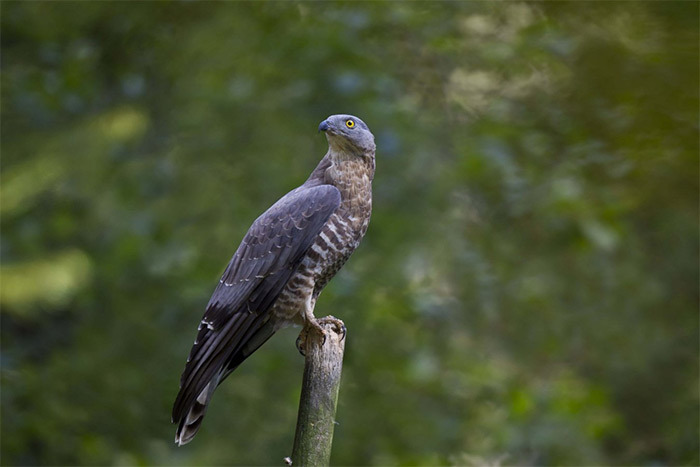 In order to ward off the predatory Northern Goshawk, the European Honey-buzzard may ape the appearance of a stronger, tougher species. The final contradiction comes from the “European” part of its name, since the species doesn’t stick to just one continent. Instead, it overwinters in tropical Africa, making its way to Europe to breed. On migration, this usually solitary species flocks together, using the earth’s magnetic field to orientate itself – supplemented by an incredible visual memory for landmarks and the ability to take advantage of winds. Like the White Stork it diverts around the Mediterranean Sea, which does not create thermals suitable to glide on. Instead, flocks funnel themselves over the narrowest sea crossings, such as the Gibraltar Strait and the Messina Strait. It’s an inspiring tale of hope, showcasing the power of collaboration – but the story hasn’t ended yet. Across the rest of Italy, illegal shooting is still rife. LIPU is now looking outwards, planning to expand this success to tackle the illegal shooting and trapping of Eurasian Skylarks and quails in Puglia, or the unlawful trapping of Eurasian Blackcaps in Sardinia. There are also plans to support local livelihoods by promoting this area as a birding tourism destination. We’ve seen what’s possible, and with your help, we can give other species the sweet taste of success. Help the European Honey-buzzard and other migratory birds by supporting Birdlife's Flight for Survival campaign, which follows the journeys of seven flagship species and highlights the work of our Partners in combatting illegal killing along their route.